Building on the success of the inexpensive Wyze Cam security camera, Wyze Labs has introduced the $30 Wyze Cam Pan, a rotating model that can monitor an entire room. 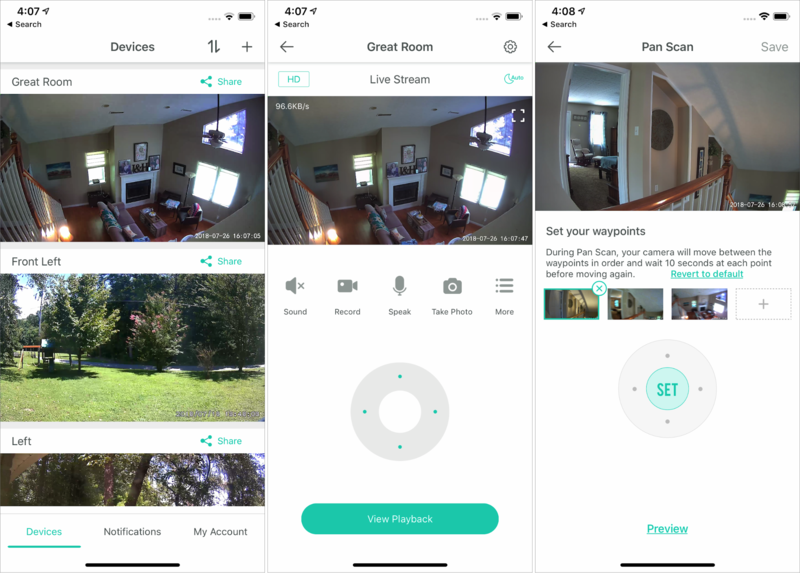 Let’s start with all the ways the Wyze Cam Pan is like its older sibling (for more details, read my previous article “$20 WyzeCam Security Camera Is Almost Too Good to Be True,” 28 February 2018). It features up to 1080p capture resolution at 15 frames per second, night vision, a speaker and a mic for two-way audio, and free cloud storage for 14 days. With a microSD card, it can record continuously for up to 8 days. 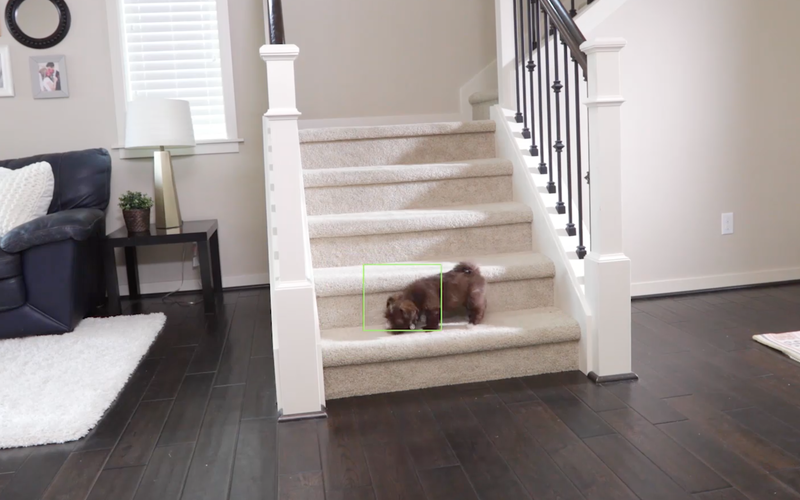 Like the second-generation version of the Wyze Cam, it can track and tag movement, placing a green box around moving objects in the recorded video to highlight them. But the new Wyze Cam Pan differs from the older model in some key ways. The first thing you’ll notice is that it’s much taller than the original Wyze Cam—5.02 inches (127 mm) versus 2.20 inches (56 mm). That makes it a bit less flexible than the small, square Wyze Cam, which can be mounted in any number of orientations. Wyze Labs designed the Wyze Cam Pan to be set on a flat surface so the camera can rotate 360 degrees on its circular base. Alternatively, thanks to a standard thread mount, you could also attach it to a camera tripod. The Wyze Cam Pan isn’t limited to just horizontal rotation: the lens itself can rotate as much as 93 degrees up and down. When I first received my Wyze Cam Pan review unit, I had some trouble figuring out where to set it up. I previously set the Wyze Cam units up on my (relatively thin) window sills as makeshift exterior cameras. That isn’t possible with the Wyze Cam Pan—it’s too big, and even if I balanced it somehow, the rotation would knock it over. Given how the camera can cover a 360-degree field of view, it’s best placed in a centralized spot. I decided on a short interior wall at the top of some stairs, where the camera can look into my great room and at two exterior doors. There are three different methods of controlling what the camera captures. First, you can control the camera manually in the Wyze app by tapping an onscreen directional pad, which is sometimes useful. For autopilot, you can set the Wyze Cam to switch between up to four custom waypoints every 10 seconds in Settings > Advanced Settings > Motor Controls > Pan Scan Settings. Tap the + on an empty waypoint, move the camera with the direction pad, and then tap Set. Also enable automatic rotation between waypoints by turning on Pan Scan, which is under More in the Wyze App’s main screen. The Wyze Cam Pan can also detect motion and move to capture it in its 120-degree field of view. This setting can work in conjunction with Pan Scan, so the camera moves automatically between waypoints unless it detects motion, in which case it focuses on whatever attracted its attention. This feature worked well in my testing, but I can’t use it normally, because the Wyze Cam Pan can’t tear its attention away from the rotating ceiling fan. If I was going to leave the house for a while, I could enable motion-detection and turn the fan off. Like its sibling, the Wyze Cam Pan doesn’t support HomeKit, so there’s no way I could build an automation that would detect when I left the house and twiddled the appropriate switches and settings. That said, both the second-generation Wyze Cam and the new Wyze Cam Pan now work with Alexa, so you can live stream video to Amazon devices that have a screen and can display video. After using the Wyze Cam Pan for a few weeks, I’ve been impressed by how much of my house it can monitor. If you’ve been looking for an indoor security camera that can cover a lot of ground, it’s an excellent choice, particularly given the extremely low cost. But we’re still waiting for an outdoor version! I bought a 2nd gen Wyze cam after your earlier article, and my opinion is that it’s not ready for prime time, yet. Mine get more false positive motion detection alerts than real ones. I have a light on a timer (controlled by Indigo), that triggers motion every night. also lightning triggers it. Neither of these is “motion”. It isn’t bothered by the large screen TV in the middle of its view however, and that’s a good thing! And similar to homekit, there’s no Indigo integration. I’d be happy with an email notification that I could send to a parser in Indigo so It could decide whether it’s a meaningful alert, or just me getting up from the couch to go to bed. The 2nd Gen Wyze cams are great and handy. I have two mounted outside in protected areas. An ABS mounting bracket is available on Amazon. A third cam is mobile and is currently on top of my evaporative cooler so I can look inside to make sure it is working without having to open the cooler. Thanks for the kind words. I love that they’re so cheap you can use them for single-purpose tasks like that. One example they’ve shown is a lady putting a camera over her grandma’s medicine dispenser to make sure she’s taking it every day. Mine would react to sunlight suddenly coming into the room. I’ve played with the sensitivity and it is no longer a problem. My main use is to look at cats during the day and to know when they are moving around. Yeah, reducing the sensitivity helps somewhat. But it still triggers Every. Night. when the light turns itself off. The lightning trigger was also at night, so presumably because it was on night vision? That’s personally not a deal breaker. The Amcrest triggers when a light comes on too. It also triggers when a car drives by at 4am (if it catches the headlights) and I’d assume it would do the same if someone had a flashlight while trying to break in! I bought a 2nd gen Wyze Cam a few months ago and it generally works great for keeping an eye on my greenhouse. I had to dial back the motion sensing because the wind would occasional set it off, so I agree it was pretty sensitive out of the box. Also the statement that there’s no way to buld an automation to detect when you leave the house isn’t accurate. You can easily set up a trigger with IFTTT that will turn motion sensing on when you leave a perimeter around your house of a few hundred feet (though I wish I could set the distance to be less than that). Any idea about the amount of data likely sent by each cam over internet daily or weekly under default settings for typical household. Just ballpark, as we have have rather slow rural internet with 30gb monthly data cap. Looked the cam up on Amazon UK. £70 ($93). Is it just me, or were they on sale last weekend? I swear they were $10 off - regular price was there but crossed off with the lesser price next to it.